Browse through the menu to choose your perfect coffee or ask one of our team if you prefer your coffee a certain way. 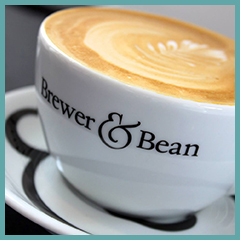 Then just sit back, relax and enjoy your freshly ground Brewer & Bean coffee, made with care by our trained baristas. Our selection of classic coffees. Perfect for coffee aficionados; simple styles that let the qualities of our coffee shine through. A real treat for the coffee lover, a short, intense shot of coffee. For a strong pick up, a double shot of intense coffee. Intense espresso, ‘marked’ and sweetened with glossy foam. The classic long black coffee, hot water topped with delicious espresso. A strong double espresso combined with velvety steamed milk. Our selection of specialty coffees. Something a little different from the simple cup of coffee - indulge in rich flavours and creamy textures. A combination of espresso, smooth milk and a thin layer of foam. A smooth mix of foamed and steamed milk with espresso. An infusion of milk chocolate sauce, steamed milk and rich espresso. Blending delicious white chocolate sauce with steamed milk & espresso. Meaning ‘coffee with ice’ it is simply that; a shot of coffee on the rocks. Our range of teas, chocolate & treats. From classic pots of tea, to luxurious hot chocolates; there is something to treat every taste here. Your choice of blend served with cold milk and extra hot water. Your choice of whole leaf herbal or fruit infusion served in a tea temple. Steamed Fairtrade chocolate milk and milk foam with cocoa dusting. A classic hot chocolate with mini marshmallows and flaked chocolate. Our selection of options and extras. Do you like something a little different? Add an extra shot, a new flavour or go skinny; have it your way. Add an extra shot of espresso to any coffee for a stronger taste. Add a shot of flavoured syrup to any of our coffees for sweetness and taste. Any of our coffees or teas can be made decaffeinated - just ask. If you’d prefer a lighter option, we can use skimmed milk. from St Austell Brewery and Brewer & Bean?